A Wrinkles must be one of the most feared problems by woman, nowadays there's so many beauty product to reduce aging process and also the beauty product to disguise the wrinkles on your faces, but not all product could be suitable for you. 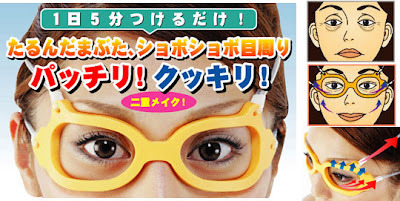 but now you can try another alternative to prevent wrinkles on your face by using this anti wrinkles glasses called mejikara. On the inside of the Mejikara glasses there are specially-designed ridges which massage and help your skin. It puts gentle pressure on the skin and pushes those sagging eyes back up to where they once were! I had no idea wrinkles can be avoided with such glasses. But they work only for sagging eyes and not for forehead foe example. Still think that a cosmetic treatment is a better way to remove the signs of aging a person has. I like to agree with Julia. The most challenging for people who care for their skin is to keep their best beauty. creams just cant do the magic, it is the proper consultation of a good cosmetic surgeon does the best part.